Enjoyed the boat trip and great to see the dolphins. We were not allowed to swim with the dolphins as there was a very young dolphin there - would be useful to know how often the tour groups are allowed to actually swim with the dolphins. 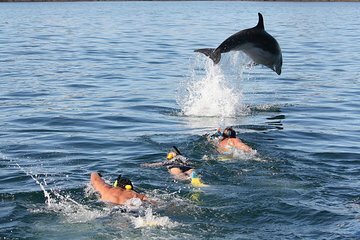 So you are likely to see dolphins but it is seems 50:50 whether you are allowed to swim with them - may be it depends on the season - would be useful to be made aware in advance. Boat was packed, so lots of people trying to get to in a good position to take photos and so a number of people miss out - I would have preferred paying more and being part of a smaller group. As we were not allowed to swim with the dolphins, boat anchored so that you could go snorkelling and see some fish etc. But there are very few fish to see at the location so not quite what was expected. Overall ok - too much overstated and hyped up !